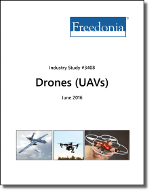 Demand for unmanned aerial vehicles (UAVs), or drones, in the US is projected to rise 10 percent annually to $4.4 billion in 2020, and the number of vehicles sold will more than double to 5.5 million. There are currently two major markets for unmanned aerial systems (UAS): the military market, which accounts for the vast majority of demand in dollar terms, and the consumer market, which accounts for over 99 percent of all units sold. These markets have very different growth prospects. US Department of Defense spending for drones will climb at only a moderate pace through 2020 and beyond, tempered by budgetary constraints and a shift in the product mix to smaller, less expensive vehicles. Most segments of the consumer UAV market, on the other hand, are in the early stages of development, and over the next decade sales are forecast to grow at explosive rates, similar to those posted by smartphones following the introduction of the IPHONE in 2007. Companies mentioned include General Atomics, Northrop Grumman, SZ DJI Technology, AeroVironment, Textron, and Boeing.